Tasting Note: The oldest expression in our peated range and a rare opportunity to experience a peated Speyside single malt dating back to the 1980s. 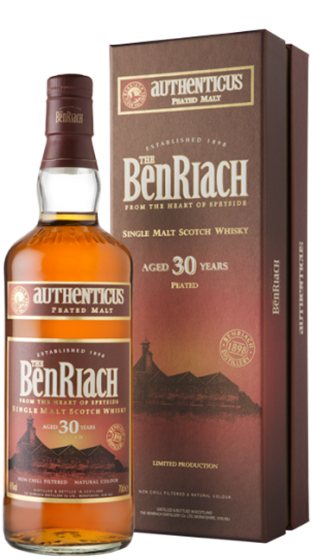 Crafted from densely peated malted barley, BenRiach Authenticus aged 30 years is a more intense Speyside malt which carries a delightful balance of WILD HONEY and PEAT on the nose. The combination of the SOFT, CREAMY VANILLA, SUMMER FRUITS and SLIGHT HINT OF COCOA coax the palate, while the INFUSED SWEET PEAT builds gradually to complete the unique character.